I was invited to attend the 1st World Student Film Festival in Okinawa by the Festival’s organising committee presided over by Shohei Imamura, the Japanese ‘New Wave’ filmmaker and two-time Palme d’or winner. Australian Film Television and Radio School (AFTRS) Directing Graduate, Cate Shortland, was also in attendance and her film school off-slate production, Joy (1999), screened at the Festival. Joy was in competition with eight other films by filmmakers from Japan, China, India and Taiwan for a cash prize of 500,000 Japanese Yen (approximately AUS $8,400) and a second prize, which was the opportunity to direct a film for the organising committee’s Operation Office in 2002. Although Shortland did not win any prizes to add to Joy’s already impressive set of awards, her film was very well received by the Festival attendees and did much to promote the quality of student filmmaking in Australia. This was despite the fact that the Festival’s projection facilities were less than ideal-Joy was shown on a video projector from an NTSC dub from a PAL VHS copy and consequently picture and sound quality were not optimal. This was a problem for many of the films screened. Nevertheless the Festival was a success, achieving its goal of bringing together outstanding graduates and students from film schools around the Pacific and Asian regions with a view to promoting cultural interchange and understanding at the outset of the 21st century. The films shown included long and short dramas and documentaries as well as a short 3-D computer animation piece. This last, Monster Game (2000), was a witty and reflexive cartoon about what can happen if you watch too much horror, thriller and sci-fi on your TV. It came from an Okinawan animator, Hiroshi Matayoshi, now based in the U.S. The Festival winner and without a doubt the standout film was a feature length documentary, Home (2000), by Japanese Academy of Moving Images (JAMI) graduate, Takahiro Kobayashi. Kobayashi explores the fraught relationships of his own family via an intimate and penetrating first person ‘home video’ style investigation. The action centres on his brother, who has developed agoraphobia and an obsessive compulsive disorder that has left him house-bound and frustrated to the point that he assaults his mother who continues to look after him in difficult circumstances. It is a challenging and compelling film that does not shy away from questioning the role of the filmmaker nor of the wider social issues surrounding this emerging problem among Japanese youth. 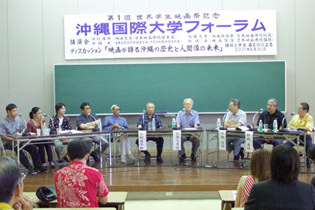 Festival seminar on the subject of Japanese and Okinawan film culture, held on the day prior to film screenings, at Okinawa International University. 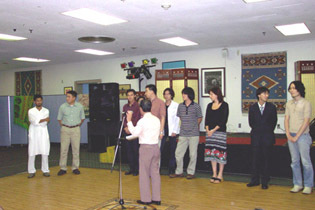 Speakers included Shohei Imamura (centre), film critic/historian Tadao Sato (on Imamura’s left), and Shinjo Taku, Okinawan filmmaker (second from right). JAMI contributed another film, a short feature called As We Go Cheering Our Flaming Lives (1999), by Ryouka Nakano (dir. and script). Like Kei Horie’s Glowing Growing (2000) (from the Art School of Japan University in Tokyo), Flaming Lives takes up the theme of suicide which seems to be a topic of considerable interest and relevance to Japanese youth culture. In Flaming Lives two teenagers who have lost family members to suicide develop a bond which allows them to work through their unresolved obsession with suicide, one way of which is to assist in the euthanasia of a woman in a coma. Nakano has written a thought-provoking and well-tempered script and has attained strong performances from the JAMI-trained principal actors. As with Glowing Growing, the pace of the film is restrained and meditative, allowing for the ripening of a mood of resolution and acceptance. Glowing Growing has excellent performances from the young male leads and moves toward an even more controversial conclusion in which the central character determines to commit suicide as part of a mass cult ritual. The film portrays this final scene in an affirmative way; faced with the life of bullying and ostracisation that he has left behind, suicide is seen as a positive move toward a future reincarnation. While it is difficult to read this film’s narrative from a non-Japanese perspective, it appears to enact a powerful negation of mainstream social pressures on young Japanese to fit in and be productive citizens. The encounter between the boy (on his way toward the location of the suicide cult) and his sister who has a ‘cool crisis’ over his unexpected appearance amongst her friends at university is a telling scene in this regard. Indian director Avhinanden Sekhri presented a travelogue style documentary, Chadar (2000), about an ancient winter trade route still traversed by people of the Zanskar river region in northern India. Chadar gives a simple yet eloquent insight into the harsh and unique lifestyle of a community that has lived in this river valley for a very long time. The last film screened was a gently humorous short about cross-cultural exchange that turns on the challenge that ‘nattou’, a Japanese delicacy made from fermented soy beans, presents to western taste buds. The director, Yosuke Kimura, is an Okinawan who graduated from Brigham Young University in the US. The only disappointing film screened was from Beijing University graduate Ji Yongyu. Ghost Man (2001) was a slapdash, transparently propagandistic tract on the evils of cults in Chinese society. Cheap melodrama drives an action plot in which the local police chief saves the community from an evil secret cult’s terrorism. In what seemed an open secret this film won second prize as a gesture of diplomatic overture toward further interactions between China and Japan (and possibly also the US). The filmmakers themselves expressed mild embarrassment (or was it wry amusement) at receiving this award. Nevertheless, the first World Students Film Festival was a lively and worthwhile encounter of films and young filmmakers from different cultures that will inevitably have more to do with each other in the coming century. The Festival is due to be held again in two years time. It is hoped that Australian filmmakers will continue to be represented at the Festival. Patrick Crogan teaches film and cultural studies at the University of Technology, Sydney.